Last week the Nazi comments were directed toward the ISU Republicans and a guest speaker. This week it’s against a group called Turning Point USA. 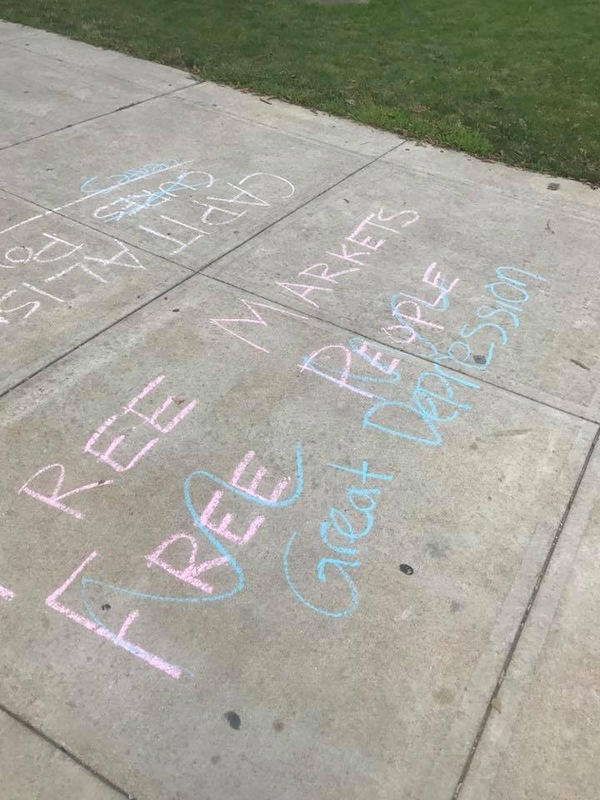 The President of the ISU chapter, Andy Byars, sent me pictures of the vandalism to chalked messages and posters they hung on campus. 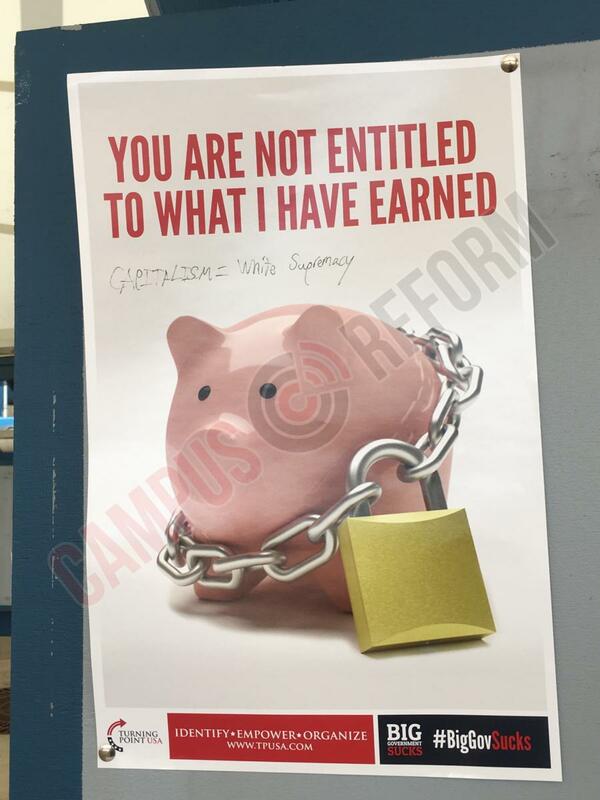 Turning Point USA is educating college kids across the country about limited government, free markets, and fiscal responsibility. For that they are called Nazis. Capitalism equals White Supremacy? I didn’t realize people selling products or services had to declare their skin color! Capitalism is the exact opposite of White Supremacy! 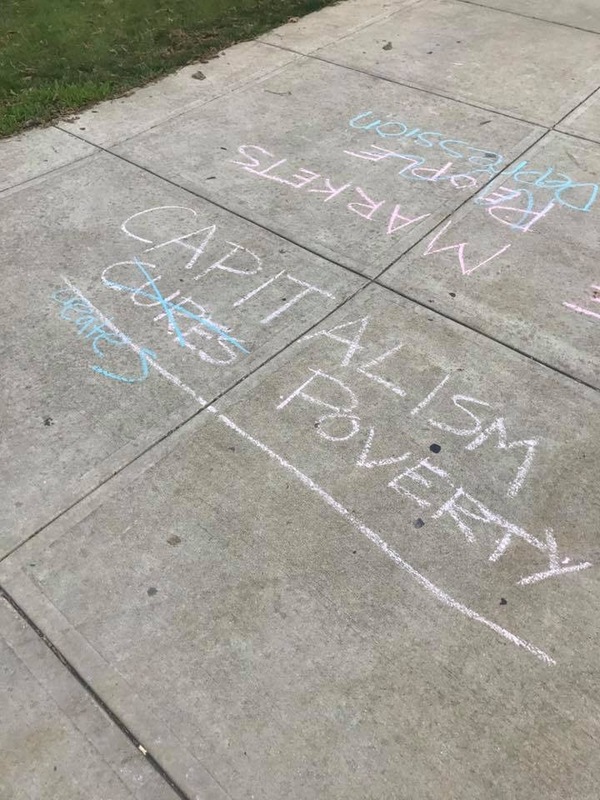 Capitalism has freed people across the globe from poverty! Google “Bead For Life” for just one small example. Is hate what ISU teaches? What are you doing about this assault on your campus? Lying about the values of last weeks speaker and Turning Point USA is an assault on this country. ISU is doing what about it? Posted in BloNo, Local, Progressives, schools.Tagged Andy Byars, capitalism, College Republicans, Illinois State University, ISU, Nick Adams, President Dietz, Turning Point USA. Those who vandalized are truly ignorant. Enough said. I find it difficult to believe ISU doesn’t have security camera on the quad. Ignorant doesn’t excuse this behavior, it needs to be yanked out. What really honks me off is these thieves continually hawk me for money. I graduated from there, all paid for by me and my parents I have never given them a dime since, nor will I – let the “favored alumni” who support the “progressive/socialist way” support them. I would urge anyone with a shred of love for our country to stop supporting most state colleges these days as well as private ones with a full blown socialist bent. To use one of “their” favorite phrases “This is not ok” pertaining to the proliferation of Marxist ideals/ideas on campus while degrading or attempting to silence any opposing views. Indeed. A university is a business. They will use slick marketing to sucker you into taking out tens of thousands of dollars in student loans in order to attend. At many universities social justice courses are now required in order to graduate. They don’t care whether or not your degree has any value in the job market after graduation. All jobs, including working part time at McDonald’s, are included as “employed” in the university post-graduation job placement statistics.